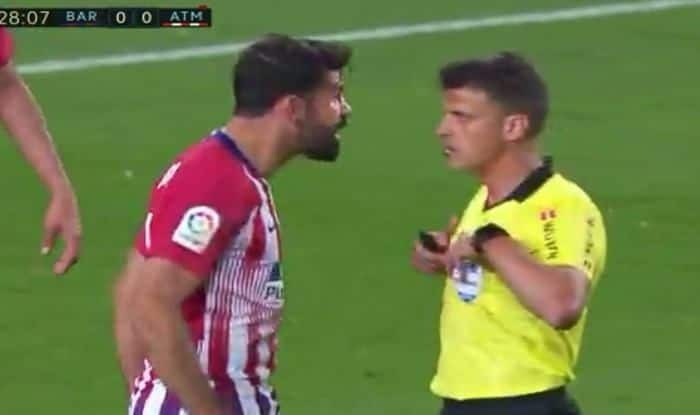 Atletico Madrid striker Diego Costa had insulted the referee in the match against Barcelona, he is now banned for eight matches which would see him miss the remainder of the season. Atletico Madrid striker Diego Costa is possibly one of the most controversial contemporary forwards of the game. His hot-headed nature on the pitch has earned him a bad reputation on the field. In the last incident when his side took on Barcelona at the Camp Nou stadium, the former Chelsea man got into a furious rant against the referee where he reportedly insulted the official’s mother. Following the incident, the Spanish striker is now banned for all of the remaining La Liga matches of the ongoing season. The RFEF has therefore ruled an eight-match ban that would see him miss the remainder of the season. Four match ban for “clear insults and offensive expressions made by the player towards the referee” and another four, after “meeting the referee with mild violence, without aggressive spirit, but in a manner that is reflected in the act of grabbing”.